I've been busy making babies....lol! 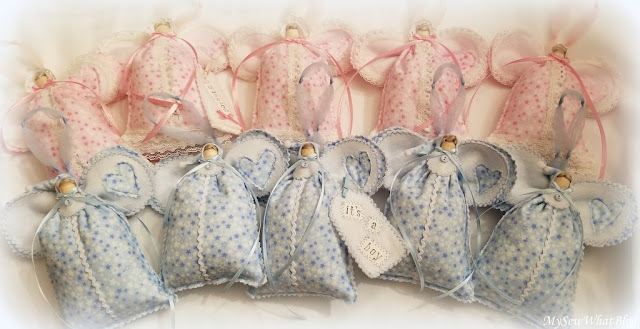 The method I used involves some cute cuddly star printed flannel in pinks and blues,(so dreamy) some lace and other trims, ribbon and a few other small but important embellishments. These were just so much fun to make! I started by making one girl and one boy. They turned out cute enough but I decided to make a few changes and tried it out first on the girls. I made five. One of them has a tag attached that I stamped "blessed." It is difficult to see in the photo but the tag is attached to the dress with a tiny pink wooden clothespin. You'll be able to see it better in another photo. Then I cut out the pieces for five baby boy ornaments. I found the teeniest little pompoms and decided they would add a cute touch to the baby boys' night caps. I stamped this tag with "it's a boy." I love their little gowns. 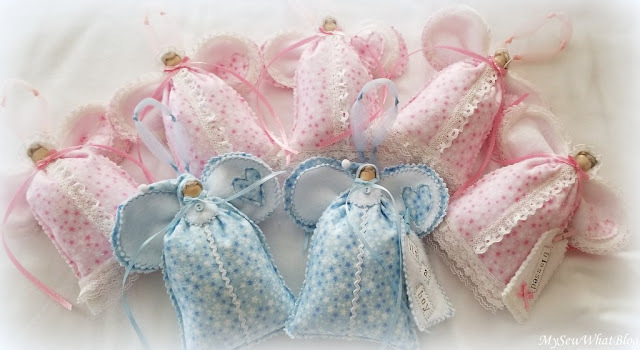 They remind me so much of the little flannel nighties my mom made for my daughters when they were babies. They were so sweet! I saved every single one!!!! Some of these are already listed in my ETSY shop. I plan to offer some ornaments with a stamped tag and others without. The one I made for a friend was stamped with a date of birth. I think they would be such cute package tie-ons for a baby shower gift or given as a surprise gender reveal gift to an expecting grandparent! 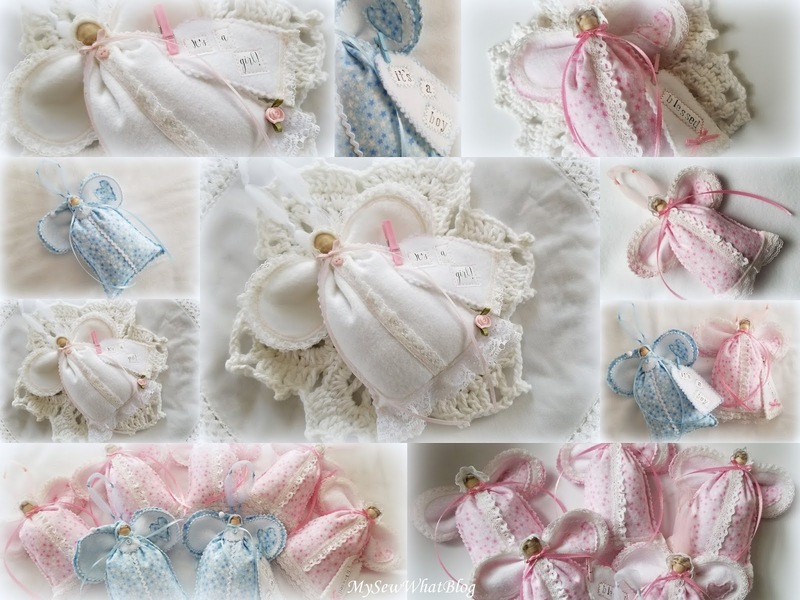 My next batch of baby ornaments will be made from some white flannel and eyelet lace. I look forward to making them later in the week. 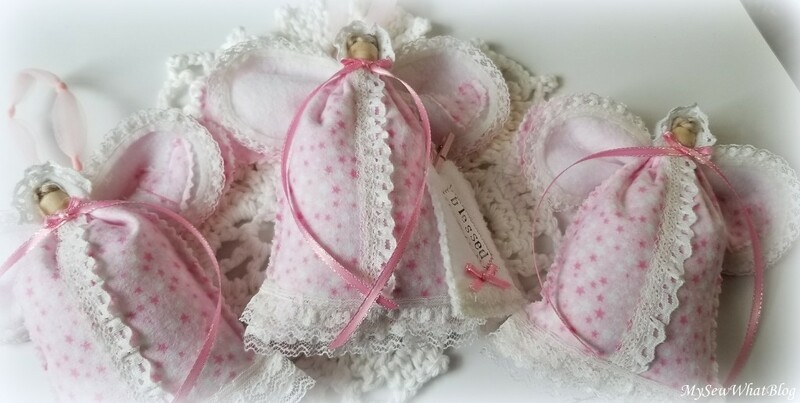 Although these do not work up quickly and do require many steps to complete, they are a joy to create and truly a labor of love! Tomorrow and Wednesday is supposed to be very warm, near 70 on Wednesday.....YAHOO! I am planning to open the windows, wash them and do a little spring cleaning! Spring is in the air!!!! 28 days and I am counting......are you? Thanks for stopping by friends! Have a wonderful week!